According to Frank Knight, nothing lasts forever. But even in death, the examination of a life well lived can teach the greatest lessons life has to offer, especially when the life is that of a community’s 235-year-old beacon – a tree named Herbie. Knight, the volunteer tree warden of Yarmouth, ME, has been fighting to keep Herbie, New England’s largest and oldest Elm tree, alive for the last 50 years, according to an article written by The Boston Globe’s Jenna Russell. Now age 101, Knight will have to see the life of his beloved tree come to an end on January 18. Herbie, a tree believed to have been planted in 1775 – a year before our country even declared its independence – fell victim to Dutch elm disease decades ago. Now, as the community comes together to mourn the loss of Herbie, they have instead chosen to celebrate his life by creating the Yarmouth Tree Trust to preserve and renew the treasured trees that line their streets. Items will be made from Herbie’s trunk and sold to help aid this investment in the future. However, the Yarmouth community is already selling T-shirts designed with Herbie in mind. 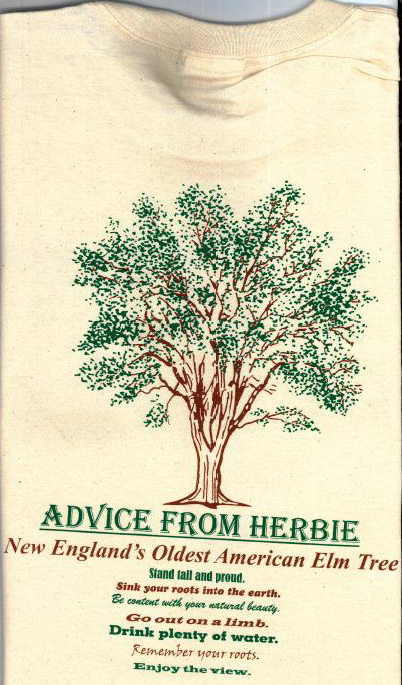 As a campaign to raise money for Herbie’s removal, as well as the Tree Trust, Yarmouth created shirts featuring “Advice from Herbie”. This advice conveys many universal truths – truths as beautiful as nature itself – and it makes us realize we must take some time to learn from the life on this earth that we so unknowingly take for granted. Here, we honor (and expand upon) the life lessons taught by Herbie the Elm tree. Be who you are and don’t care what others think of you. Be confident with your individuality because no one else can ever be you or take your place. You’re special and you have something very important to offer this world, whether you realize it yet or not. Find yourself and never let go. Remain steadfast in your beliefs and never let others sway you from remaining true to who you are. Standing behind your morals will give you a kind of strength not many attain. Knowing what you want and what you believe in will keep you strong and dignified as others may waiver in their uncertainties. Stop obsessing over those minor imperfections that cause you to dwell on your appearance in the mirror for hours at a time. It doesn’t matter if every hair is in place or if the circles under your eyes are a little bigger than normal. The beautiful person you are inside shines through in everything you do, completely overshadowing those physical flaws you keep trying to conceal. Take a chance. The worst thing that could happen is failure, but who cares? We can only learn how to do things right when we recognize what we’re doing wrong. So do something crazy, make some mistakes, or speak out above the crowd. Eventually standing under those leaves are going to cast a never-ending shadow on who you want to be. Climb to the top. Maybe you’ll only find clouds, but the chance the sun may shine is more enticing than never knowing what might have been. Stay healthy (and drink those suggested eight glasses a day)! Taking care of yourself – mind, body and spirit – is your first priority. You will never be able to do any good for anyone else or the world if you don’t make yourself your first priority. Only then can you pursue your goals and make this world a better place. Spread your wings and fly. Explore faraway places and distant lands. But no matter how far from the soil you may reach, always keep a piece of yourself grounded. Remembering who you are and where you came from can be details that get lost in the shuffle of pursuing your dreams, but it is those roots connected to where your story began that keep you humble, honest and connected to the values and truths that you hold dear. Ignore the ugly things in life that cloud your vision. Forget the rundown houses in the poorest section of town; focus on the families thriving on each other’s love as they struggle to make ends meet instead. Pay no attention to the latest homicide reports on the news; revel in the beauty of a child’s first cry as they enter this world. Not everything in this world is ugly, and if we can even see this beauty in the face of death, then there still may be hope for this planet yet.